Gourmets visiting Sylt, Germany’s idyllic North Sea vacation destination, can choose between fresh Pacific oysters and native blue mussels. But what seems like fine dining is actually a cautionary tale as the foreign oysters threaten to overrun the native mussels. 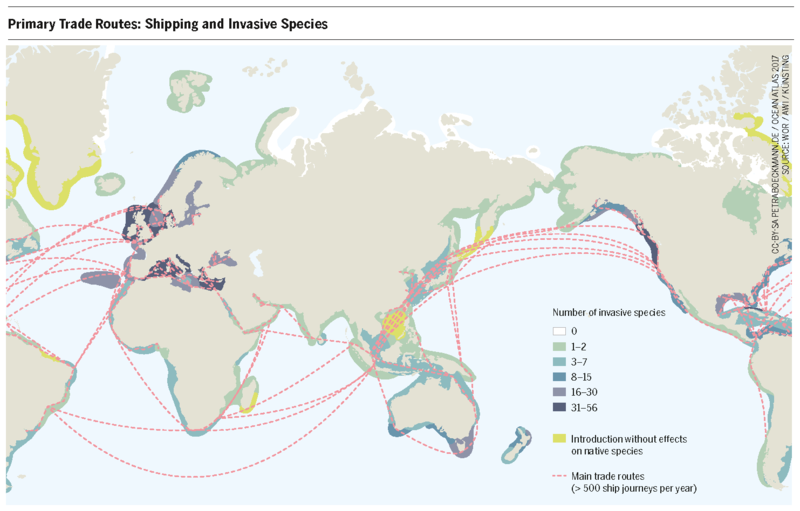 While the main threat to marine biodiversity is the exploitation and pollution of natural habitats, there is another: invasive species. The case of the Pacific oyster’s colonization of the Wadden Sea, a UN World Heritage Site along the German and Danish North Sea coast, is a prime example. The oyster is more than just a delicacy there – it is also a plague. But how did it get there? Drifting tectonic plates have separated continents and isolated islands for centuries, enabling millions of species to develop in diverse habitats. But now the continents are coming together again in a very different way. Each day, thousands of species cross the oceans in the ballast tanks of ships or on bits of floating plastic waste, eventually disembarking from their long journeys in foreign ecosystems. For some the differences are too great and they perish. Others, though, are able to thrive in their new surroundings. 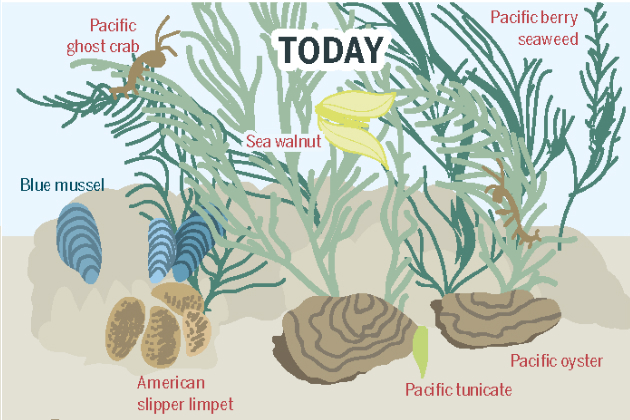 The Pacific oyster is one such generalist. What sets the conquest of the Wadden Sea apart from similar tales of invasive species taking over foreign ecosystems is that we know just how the Pacific oysters got there, and why. By the 1950s the native European oyster was nearly extinct due to disease and overfishing. At the end of the 1970s, a team from the German Federal Research Agency for Fisheries began investigating whether the hardier Pacific oyster could provide an alternative for local oyster farmers. The results were promising – the foreign oyster flourished in the North Sea. The Wadden Sea was rich in nutrients and the well-fed oysters thrived. Until the mid 1990s there were fewer than 10 Pacific oysters per square meter off the coast of Sylt. By 2007, though, that number had increased to 1,800 per square meter. During the same period the blue mussel population declined drastically. And they were not the only species affected. For instance, the oystercatcher, a species of bird, feeds primarily on mussels. The shell of the Pacific oyster is too thick and hard for it to serve as a replacement meal. The pressure to adapt is rising – and the lower an ecosystem’s biodiversity, the more difficult it is for it to react to environmental changes. An even greater problem for the biodiversity of a habitat arises when a foundation species is threatened. Foundation species provide the basis of an ecosystem; other species rely on them. Think of the kelp growing in the seaweed forests on the North American Pacific coast, which resemble underwater primeval forests teeming with life. Or consider the coral of the Great Barrier Reef off the coast of northern Australia: the 360 hard coral and 80 soft coral species of the world’s largest coral reef are home to more than 1,500 species of fish, 1,500 species of sponge, 5,000 species of mollusk, and 200 species of bird. Many of them are threatened with extinction, including aquatic mammals like the sea cow. If the coral die, the entire ecosystem will lose its foundation. Some of the more flexible species may adapt or move away, but others cannot. How can we act sensibly in regional ways to protect the diversity of the ocean from global environmental changes? We cannot quickly halt the warming of the ocean, and it is impossible to reforest the coral reefs on a large scale. Saving the biodiversity of the Great Barrier Reef requires just one sensible act on our part: to simply avoid adding additional stressors to the reef’s ecosystem. For example, pollution must be prohibited. Other than preventing harm as much as possible, there is nothing that we can do besides rely on the self-healing power of nature. After all, parts of the southern reef are still alive. The flora and fauna there could eventually resettle the northern section. If the reef collapses completely, though, the original biodiversity would be irreparably lost. Beaches littered with plastic garbage, seabirds strangled by bits of plastic – these images are ubiquitous today. Yet we also see photos of people cleaning beaches and hear about plans for purifying the ocean. Are things actually improving?